"Those who want to get with the latest US program must put the blame on Syria. What for? Doesn't matter in the least. Whether it is for the two world wars, the demise of Elvis or sinking the Titanic, Syria makes a handy and eminently fashionable punching bag..."
"...This is the reality we must deal with. It's not important to approve or refuse accusations against us. We must read what's behind them; and what's behind them is now obvious: The beginning of an attack against Syria. Maybe we had a lot of differences in the past, maybe we will have lots in the future (...) But Syria will remain our great love. 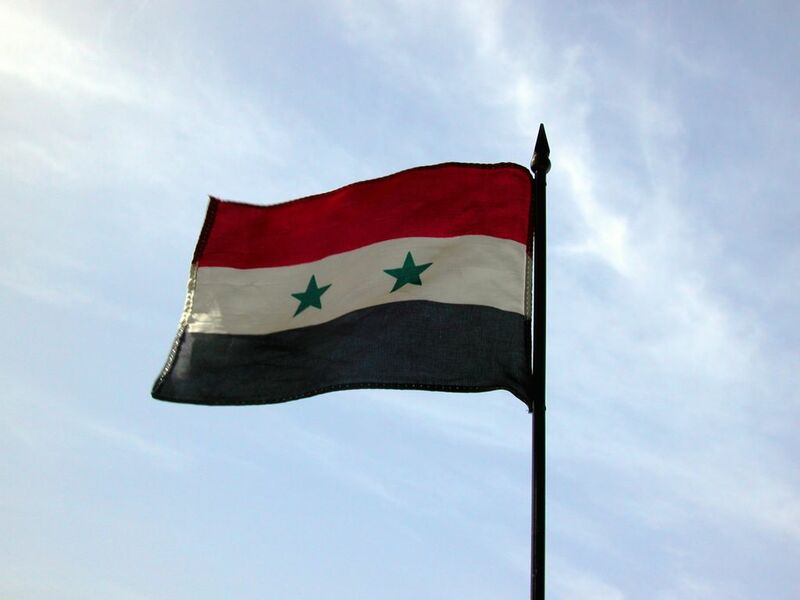 Syria will remain the dream that unites us (...) Let's love Syria, pray for her, defend her. Today Syria needs all her sons, needs us to be her sons, just her sons." Well I guess and hope in case of something bad happens to Syria god forbid, that most Syrians will do the right thing and stand next to our beloved country. So the so-called 'international community' wants Syria to implement UN resolution 1559 and pull out its army from Lebanon. Interesting case of double standards and hypocrisy there. There are many outstanding UN resolutions some of which are decades old calling on the zionists to withdraw from the West Bank, the Gaza Strip and Al-Quds yet have we ever seen any kind of REAL economic, diplomatic, political and/or military pressure applied by the self-styled 'international community', (really a euphemism for the US, UK, France etc.) on the zionists to implement UN resolutions. Come to think of it has there ever been any real pressure by the 'international community' on India to inplement UN resolutions on Kashmir, not really! Let us contrast this with the present situation where the pressure on Syria is intense and sustained to implement 1559. Let us take another recent example: East Timor - a former Portugese colony annexed by Indonesia but now independent after a bloody struggle. Initially the 'interantional community' didn't pressurise the Indonesians to leave East Timor for cold war geopolitical reasons but afterwards the pressure on Indonesia was fairly intense and sustained to leave east Timor which it eventually did. Another example 'conveniently forgotten' by the 'international community' is the Turkish annexation of northern Cyprus and the UN resolution condemning it and requesting the Turks to withdraw from there. Has anybody ever seen any kind of serious pressure brought on the Turks to withdraw their armed forces from northern Cyprus or is it a case of not 'offending' our NATO apply. Therfore in the above examples any reasonable person can see that the 'intenational community' has quite blatant double standards and hypocrisy when it comes to implementing UN resolutions and calling for various countries to withdraw from other territories. So it begs the question that why is Syria under such intense and sustained pressure by the US and its poodle the UK as well as surprisingly France. It is because Syria is the ONLY Arab and Muslim country in the region along with Iran that continue to have PRINCIPLED and CONSISTENT stands on Palestine and the suffering of its people, the Iraq war and other geopolitical issues, i.e. they are NOT subservient to the US, UK and the zionists unlike Jordan and Egypt! The other countries in the region have foolishly and for short-term gains lost their principles and morals. This includes the regimes of Egypt, Jordan and Mauritania who have broken Arab and Muslim unity and have decided to recognise the zionists and establish diplomatic and economic relations with them! It also includes regimes that have been having secret contacts with the zionists in an attempt to 'normalise' relations with them such as Morocco, Tunisia (where Ben Ali personally invited the butcher of Lebanon and of Sabra and Chatila massacres to attend a conference), Qatar, and Oman. It also includes the so-called 'conservative Arab monarchies' (really a euphemism for hereditary dictatorships of bedouin clans who are pro-western puppets who enforce an extremely narrow-minded and extreme interpretation of Islam and calling any other Muslim who disagrees with them infidels. They also love to oppress women by not allowing them to vote or drive cars because it is supposedly a bid'ah but allowing US troops into the land of the Haramayn is ok!) The 'conservative Arab monarchies' just pay lip service to the Palestinian cause and the suffering of ordinary people, in fact they are completely useless as can be witnessed when Iraq invaded Kuwait. Despite spending BILLIONS of US $ on arms and ammunitions they still had to 'invite' foreigners to defend them! So only those countries that can upset US and zionist hegemony of the Middle East are under massive pressure. If Iran has an active nuclear program then it is bad and is harrassed almost daily by the US, UK, France and Germany to give up its pursuit of its nuclear technology. However all of these 'liberal western democracies' turn a blind eye and completely ignore the zionists' flourishing nuclear weapons program and its nuclear reactor at Dimona (which incidentally the French who claim to be the friends and allies of Arabs helped to build in the 1950s). The Dimona reactor has never been subject to any kinds of independent inspections by the IAEA but Iran must have regular inspections. All the surrounding Arab countries have (foolishly) signed the nuclear non-proliferation treaty(NPT) but you will never hear the 'international community' exert any kind of real pressure on Israel to 'roll-back' its nuclear program and dismantle its array of nuclear weapons. Israel is allowed to maintain its so-called policy of 'nuclear ambiguity' and its oft-repeated and deceptive claim that they 'won't be the 1st to introduce nuclear weapons into the Middle East'. If that is the case why did the Israelis threaten to use their nukes against Syria in 1973 when the Syrian armed forces were making goood gains on that front, if the US didn't supply Israel with more and more conventional weapons! To the Lebanese people I say that you should be grateful to Syria and its wise late President Hafiz al-Assad who intervened and saved you from yourselves and your petty militias killing and massacring each other! It is Syria that disarmed and dismantled all these militias and restored stability to Lebanon and made sure that it survived as one country rather than fragmenting into Christian, Sunni, Shia and Druze mini-states which would in all probability have become clients and vassals of the zionists. It has to be admitted that the Syrian influence has not been completely benign. The ever present and feared mukhabarat, istikhabarat, al-amn al-'aam, deuxieme bureau etc. and other secret branches of the intelligence and securuty apparatus have done a lot of terrible and horrific things in Lebabnon. However lets be frank in which Arab country is there any real freedom or democracy or where people are allowed to express any dissent of the regime. Basically nowhere and if you do then the mukhabarat will arrest you and you will 'disappear'. This could mean that you have been tortured to death in a secret prison or languishing in a jail for decades. This does NOT only happen in Syria and Lebanon but also happens in 'progressive Arab republics' like Egypt, Tunisia, Libya, Algeria and Iraq as well as 'conservative Arab monarchies' like Morocco, Saudi Arabia and Jordan. The real question is what has happened to Arab society and culture that it has come to this point. 1. The Algerian war of Independnece in which at least 1-1.5 million were martyred by the French! 2. The partition of Bilad as-Sham after WW1 was due to both French and British connivance under the pretext of a League of Nations mandate! 3. France was actively involved in helping Israel build a nuclear reactor at Dimona as well as its subsequent help in military uses of nuclear technology. 4. France did NOT oppose the war on Iraq on some humanitarian or moral grounds. The main reason was that they were dealing with Saddam's regime and making billions of dollars from the now discredited oil-for-food and other questionable UN programs. They and in fact the Russians and the Chinese all knew that if Saddam and his regime were overthrown then their lucrative deals and contracts would end which is in fact what has happened. Now the US and its companies have got all the lucrative contracts and deals after finding no WMD! If the worst comes to worst then please put aside any historical, ethnic, linguistic and sectarian diffreneces. The Kurds, Arabs, Iranians and Turks must unite to resist the neoconservative (or should that be neocrusader) and zionist agenda to dominate the Middle east! Really well said, obviously you know a lot of things about Geo-policy, you're right when you underline the fact that most Un resolutions ordered to Israel were not respected, and Now they want to make Syria accept 1559 by force even if it's bad or good Which shows that Israel has some relations with USA or UN! I didn' knew for France, i though they were really against this war, but I knew that they were trading with Saddam but i didn't knew that it was as important as you say. Keep posting Ayman, your subjects are pretty good and it invite easily people to post! Inshallah Allah Subhanu wa Ta'aala in His infinite mercy will protect Syria and its people from the intrigues against it! As we know there are many saheeh ahadees about the merits of the Sham and that the Sayyiduna Muhammad Mustafa (may Allah's peace and blessings be upon him) made special dua for Syria (and Yemen) and its people. Well as for 1559 UN resolution, if I remember right it was France who posed it, that was a few days after Syria signed a major gas contract with Canada and let's say the French government really wanted it bad. I spent and lost a lot of time just thinking why is the world acting this way towards us, I tried to understand why, and I reached to an conclusion no matter how much the westerns (in particular) show us their nice and warms smiles, it's still smiles nothing more, let us not forget what were these countries to us more than 60 years ago, they were our enemies and even if somehow we forgot, they haven't. So eventually I reached the conclusion why should I wait acceptance and help from who considered me as a danger as well as an enemy. I hate saying that, I wish the world is a better place but this is how it is. The Syrian regime should understand that the only effective card to surmount the pressures is the support of the syrian people .Hugo Chavez in Venezuela demonstrated it well where he cut the american hands from his country. At the contrary this regime ignore the people essential rights and is building a network of political and economical interests protected by the new trust companies managed by the relatives of the keys of this regime and other mafia groups associated to him which prevent any improvement of the Syrian economy . This regime accustomed us to the political business with the enemies of the Syrian people, the Americans and Israelis, at the cost of the liberty, honor and dignity of the Syrian people. The Syrian regime invaded Lebanon following this kind of business years later with the approval of the Israelis and the Americans, the Syrian migs bombarded the presidential palace of Baabda and received Lebanon in exchange of the Syrian support in desert storm operation. In 1982 ,this regime killed more than 25 000 civilians in the city of Hama and destroyed the historical center ,palaces ,churches and mosques...after that the syrian regime was congratulated by the american government. Yesterday it was reported that Syria provided information that led Iraqi authorities to breaking up 35 insurgent cells in the northern Iraqi city of Mosul and arresting some 750 suspected militants. Syria for all syrians ! I hope the rumbles of war stay just that - rumbles. Why don't we just leave Lebanon NOW. The Lebanese don't want us there. The Lebanese don't recognize any sacrifice that the Syrian people gave to prevent them from blowing each other and their country to bits. Enough-it is THEIR country. I felt horrible over the death of Hariri and felt much pain for the Lebanese people. But some Lebanese have used his death as an opportunity to bring disaster to Syria. Enough. Let's leave, protect our own borders and leave them to deal with their "friendly" neighbours and Western "friends". Perhaps I'm being optimistic, but I don't think the US will attack Syria anytime soon, and hopefully never. They are dealing with the chaos in Iraq, and the last thing they would want to do, would be to outstretch their resources even futher. What ever the outcome is, we will all stand next to Syria. It is one thing being away from your country, but to see the place of all your memories get ravaged is a whole different story. We said: "Bush will not go for war in Iraq, well we turned out to be wrong, he did enter Iraq. And looking at the geo-political location of Syria, it is not far from being imaginable that our country will be the next in line. We hope that there will still be a way out, but.... it's narrowing. Ayman.. To me it's strange that you delete all our comments on "Lebanese Sharpnel" because what I thought to be is your attitude of avoiding political discussions. Then you posted again on the Lebanese-Syrian issue and you did not offer opportunity for comments. Now, this new article is full of double-sided discussions and comments. Can I just ask what is going on? Serbest, I had to delete previous comments because of bad and offensive language by "anonymous" people. Sorry about that. The Russians also now want Syria to quit Lebanon as stated by Sergei Lavrov, the foreign minister yesterday. The question for Putin (the butcher of Chechnya) who has been responsible for thousands of deaths there as well as hundreds of tortures and the imprisonment of civilians in concentration camps plus rapes of girls and women (all by vodka drinking Russian troops) is when will Russian troops withdraw from the Muslim territories of Chechnya, Ingushetia, Daghestan, Tatarstan, Bashkirstan etc. Before joining the usual suspects and telling Syria to leave Lebanon, Putin and the Russians should look at their own disgusting and depraved behaviour rather than giving moralistic sermons to others! The people demonstrating in the 'inquilab al-arz' as this drama is called by the western media mainly involves the Falangists (Kataib Lubnaniya). These people are an extreme right-wing group with links to Franco the fascist dictator of Spain and models itself on the Nazi/Fascist parties of Germany, Italy and Spain. It should also be remembered that these people are the ones who led by Elie Hobeika committed the Sabra and Chatila massacres of Palestinians in 1982 with the collusion of Sharon - a war criminal! The Falangists are also the people who invited Sharon & the Israelis to invade Lebanon in 1982 which led to further destruction of Beirut and Lebanon. Now these Falangists and their supporters are pretending to represent the majority of the Lebanese people and demanding that Syria pull its troops out. Contrast this with Hezbullah and other resistance movements that defeated and humiliated the Israelis in Lebanon and then again in southern Lebanon in the 'so-called and self-styled' security zone. The resistance movements also did the excellent martyrdom operations to kick out the US Marines and the French troops from Beirut! Hezbullah, Al-Manar TV and Sayed Hassan Nasrallah do excellent propaganda and psychological warfare against Israel and they really are scared of them. Part of the agenda of the 'inquilab al-arz' is to dismantle and destroy Hezbullah which is the FIRST Arab and Islamic force to defeat and scare the Israelis. Also note that the cedar tree is not exclusive to Lebanon, there are probably more of them in Syria than Lebanon! Elie Hobeika who did Sabra and Shatila massacre ,Pakradouni who meet several times Sharon inside occupied Palestine ,Michel Murr and others were all alies of the syrian regime and ministers in pro syrian government...in the other side not all of the opposition is dirty .there are Elias Atallah who fought the Israelis and moderate christians like Nasib Lahoud and Samir Franjiyeh most of the sunni lebanese community is against Syrian regime.Dont forget that the syrian regime killed more palestinians than Sharon did and bombarde heavly the sunni cities of Tripoli and Saida . I'm not conviced about Hezbollah propaganda because their allies in Iraq collaborate with the americans and joined the iraqi army backed by the americans and israeli officiers. Jack Straw, the British foreign secretary (who is in fact a yahoodee) has threatened that Syria will become a 'pariah' in the world if it does not bow to the 'will of the international community' (to use a famous phrase which really means the US, UK, Israel, France etc.) and withdraw from Lebanon. Yet again there is no pressure of any kind on Israel to withdraw from the Golan Heights, West Bank, Gaza Strip or Al-Quds in massive defiance of UN resolutions and international law! As usual the puppet & despotic wahhabi regime in Saudi Arabia has advised 'brotherly Syria' to 'bow to the will of the international community' and leave Lebanon - almost sounds that the US, UK, France, Israel, Saudi, Egypt and other 'brotherly Arabs' are talking from the same piece of paper! With Arab brothers like this who needs enemies like Israel! The assasinations of Lebanese religious scholars such as Mufti Hassan Khalid, Sheikh Subhi Saleh and Sheikh Ahmad Assaf have also been committed while Syria was providing 'security and stability' in Lebanon. This happened as well as what one of the earlier bloggers wrote, namely the blockade and bombardment of cities like Sidon and Tripoli which are predominantly Sunni. Also the Syrian army colluded with the Falangists in the massacre of Palestinians(who are mainly Sunni) in Tel al-Zaatar camp as well as blockading other Palestinian camps such as Bourj al-Baranjeh and Ein al-Hilweh. But this is not really shocking given the Hama massacre where about 30-40k people died according to reliable estimates. Read Pity the Nation: Lebanon at War by the famous British journalist Robert Fisk - but NOT in Syria ONLY when you are OUTSIDE the country for a balanced, objective and readable account of the Lebanese civil war and other infamous incidents! It is very shameful indeed that all the other Arab countries have abandoned Syria in its hour of need just like they abandoned Iraq before. Also the Russians who try to portray themselves as friends of the Arabs have also abandoned Syria just like they abandoned Iraq. In this scenario it appears that the ajami country of Iran is a more loyal friend and supporter of Syria than the Arab countries or Russia! Hopefully, they will seize the opportunity to avoid war by doing so.